The design wizards at Sea-Doo must have tapped into some other worldly powers when they conjured up the all new 2011 Sea-Doo GTI SE 130. It’s sleek, it’s stylish and it’s like no other “entry-level” watercraft on the planet. For 2011 Sea-Doo gave the GTI a complete and total makeover. Most notable is the look and style of this new boat. With high-end looks that are right in line with its luxurious GTX compatriots, it also boasts a new lighter hull and overall longer length, which directly translates into increased stability and performance. The designers also narrowed the seat and rounded out the footwells, resulting in an overall greatly improved rider experience. The new GTI is both style and substance. The SE 130 model comes loaded with features that in previous years you could only have dreamed of having included on a watercraft at this price point. 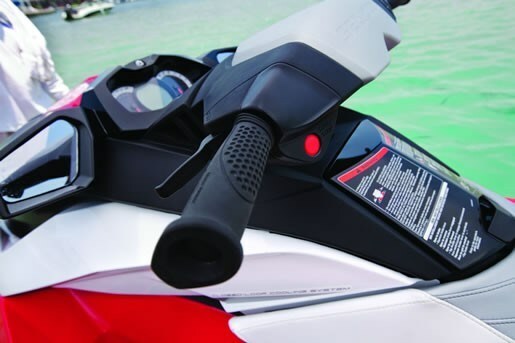 Sea-Doo’s Intelligent Brake and Reverse (iBR) comes standard on this craft, as does the Intelligent Throttle Control (iTC). The iBR system is engaged by squeezing the left hand lever, which allows the driver to engage the formidable braking system, or to shift the craft into reverse. The brakes on this model and all of the new Sea-Doo watercraft are truly something to be experienced, creating stopping power that literally blows away the competition. The reverse feature is intuitive, easily controllable, and is especially useful when manipulating this boat around launches and docks. Not to be over-looked, is the Intelligent Throttle Control. This system introduces various performance enhancing modes such as Touring and Sport, as well as a fuel conserving ECO mode. With the ECO mode engaged, an onboard computer limits the rate of acceleration and overall cruise speed resulting in a 12 percent reduction in fuel consumption at an average speed of 48 k/mh (30 mph). Also standard on the SE model is the Variable Trim System (VTS), which allows the driver to adjust the nose angle of the watercraft higher (providing stability at high speeds) or lower (for towing and quick starts) with the simple press of a button. The digital driving center provides full control over all 23 different functions this PWC offers. The 2011 GTI 130 SE features the same 130 hp Rotax 4-TEC, 1,494cc engine from previous years. However, with the new hull design, and the addition of the performance enhancing Sport mode, this craft handles significantly better than its predecessors. The response from the throttle is instantaneous and the acceleration is smooth and powerful. It effortlessly achieves a top speed of 85-88 km/h (53-55 mph) and being a lighter watercraft it actually feels much faster, and handles better than heavier, bulkier boats. The hit parade continues with extremely useful features like a fold-down reboarding step at the stern of the boat, and an included iControl-programmable Learning Key, which can restrict the top end speed of the craft. This feature is extremely useful for younger or more inexperienced users. Operators will also appreciate new wide-angle mirrors, and an abundant storage capacity of 116.6 liters (30.8 gal.). 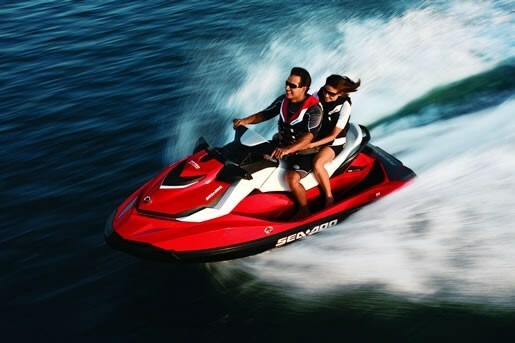 The 2011 Sea-Doo GTI SE 130 comes available in Black and Sunshine as well as Viper Red. This is definitely one personal watercraft that isn’t going to leave you snake bitten on price or performance.